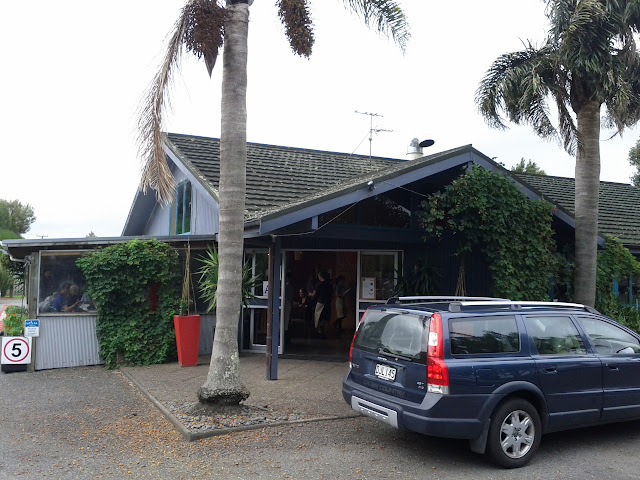 The Hallertau Brewery was the site for the final lunch of lunch on our trip to New Zealand, a short dive out of Auckland, but it felt like we could have been much further away. The interior has some German references, which also where the name comes from. There is a fair amount of focus on the beer, but also lunch and dinner menu's. The paddle gives the opportunity of trying out 5 of the different beers brewed. The fish and chips looked great and was a generous serving. The club sandwich was almost impractically large, with smoked chicken, avocado mayonnaise, lettuce and tomato. It proved easier to consume after being disassembled! The fish of the day was presented with more panache than the other dishes and was apparently very good, it came with a lentil and cranberry salad. We were able to enjoy a relaxed Sunday lunch and catch up with friends before our departure without being hurried out, and it was a great spot to spend our last few hours before jumping on the plane. The beer wasn't bad either.